I have been married for nine years and have 2 boys one step son and a biological. Through the years I have tried to talk out problems and try to work on ways to make them right. My wife now thinks I am passive aggressive and she is right. I was never like this before. I could talk in past relationships and now when I disagree with my wife she says I am yelling at her and she shuts down and will not talk and continues with the same behaviors. Examples - spending money when times are bad - undermining decisions with the kids - poor management of the household - and the way she talks to the boys. I do realize that I have and still strongly disagree with the decisions and actions that she makes and not being able to talk them out has gotten me to the point I just tell her what she wants to here to stop the madness to get on with the day. I feel that she is unreal and confused about how things need to be and should be handled normally. We are in financial trouble, she has no drivers license from past tickets, and she has medical issues and bills (neurological). I am sure that I am not making any sense. If you can figure this out, please help. I think I am going to lose my family. Hello Wade, and thanks for telling your story here. I'm sure your concerns about your wife are valid, and you have good reason to feel the way you do. The important thing here is that you don't want your reactions to make things worse instead of better. So, the first priority is to understand and heal the cause of your anger. While your wife is totally responsible for her behavior, you are totally responsible for your anger. You will find a full process for dealing with your anger on this FAQ page. 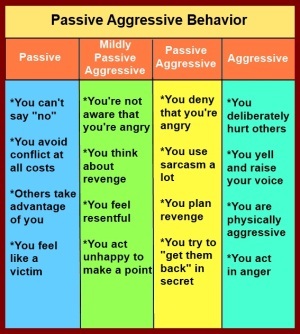 I also encourage you to read further about passive aggressive behavior. If you do these exercises, you will have the opportunity to learn a different focus in your marriage. Your focus on your wife's problems is not helping her to improve. She will only improve (if she chooses to do so), if you are able to focus on her positive qualities, and stop all fault-finding and criticism. If her faults are so great that you find them intolerable, you may want to consider that this marriage is not right for you. If you choose to stay married to her, however, your task is to love, support and appreciate every single positive aspect of your wife, all day, every day. I hope this is helpful to you, Wade. Believe the best of yourself and your wife.